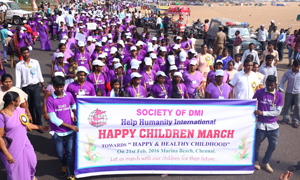 DMI as an organization is dedicated to serve the poor particularly the poor children. The “Happy Children March” was blessed by Rt. Rev. Neethinathan, the Bishop of Chengalpattu and flagged off by a Senior Police official. It was a colourful march with dance and expressions of happiness. The pathetic situations of the people and the precarious warnings from the Meteorological Department forewarning incessant rains had flung the DMI and MMI into relief work.